Branching a new discussion based on some user feedback and some comment from Jaymie on the redesign topic Jaymie's comment regarding Data Types. Can be disturbing for new users. The fact that once a data type is set for some nodes, you have to manually reset it before being able to connect another type. This could lead to people thinking you cannot connect such type to that node. The thing is I wouldn't want the Editor to replace by default the type because as for some other nodes, the convert type or choose value from type can be handy. In other words, the more control the better? a - Random List to Curve (with type set to 3D Point). This is great ! This is what I mean with more control ! Perhaps in this case, below the first options, we could just get a "(Re)set Curve to Real Type" option. b - 3D object Type to 3D Point. For stuff that have no common stuff and where you couldn't reuse any part, the same menu as before could roll down with an option "set type to 3D object". c - Share value issue. 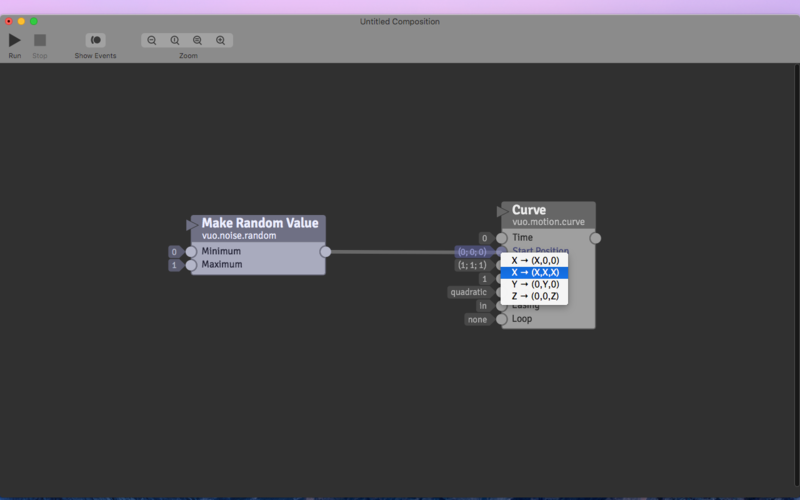 A shared 3D point to a "Make Random Value" automatically chooses the x value for me it seems. While it is so great to be able to choose and have control 'like mentioned above), here I seem not to be able. To resume, no less control, more control, more options, but a simplified to reset as a dropdown option perhaps !? 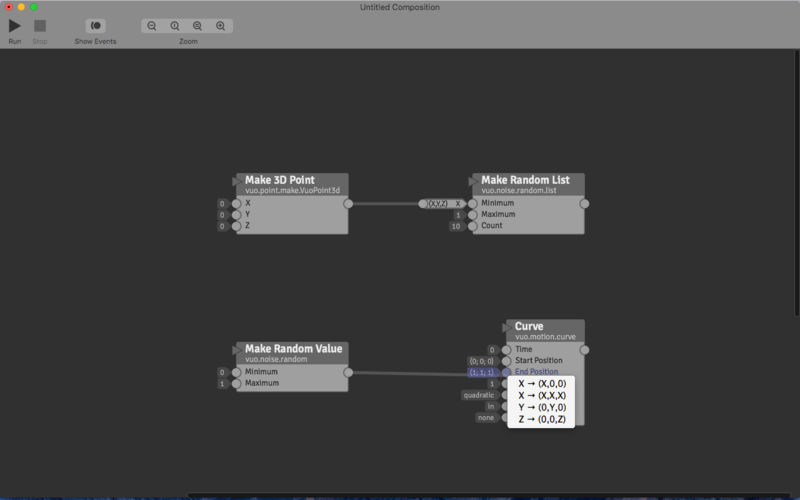 Same for Make 3D Point to a "Make Random List`. Automatically seem to choose x.
Workaround is to manually add a get 3D Point values nodes. On another note, maybe a very dumb question but we are able to merge x,y,z lists, but is there a way to retrieve all the x values of a list only ? The fact that once a data type is set for some nodes, you have to manually reset it before being able to connect another type. This could lead to people thinking you cannot connect such type to that node. Always show the "Set Data Type" menu option when right-clicking on a port that can be generic, even if the port is already set to a data type. Move the "Revert to Generic Data Type" option into the "Set Data Type" menu, renaming the option to "Generic". In the "Set Data Type" submenu, show a checkmark next to the currently set type. When trying to drag a cable between ports of different types, show a menu option "Change Port Type To 3D Point" (or whatever type would be compatible) in addition to the type converter options. That's for lack of Convert 3D Point to Real (Y) and Convert 3D Point to Real (Z) nodes to go with the Convert 3D Point to Real (X) node. There's no reason not to have those nodes, we just haven't added them yet as of Vuo 1.2.1.
we are able to merge x,y,z lists, but is there a way to retrieve all the x values of a list only ? Convert 3D Point List to Real List (X) and (Y) and (Z). These should come up as type converter options like (X,Y,Z) -> X when trying to connect a cable from List of 3D Points to List of Reals. Yep ! They do ! Sorry. Don't remember last time where I was trying something like this and it didn't. Perhaps I did not set the correct data type on the 2nd node. Will comment if I remember but it really sounds like my fault here ! Sharing another thought here, not really about data types but somehow related to ports and menus. 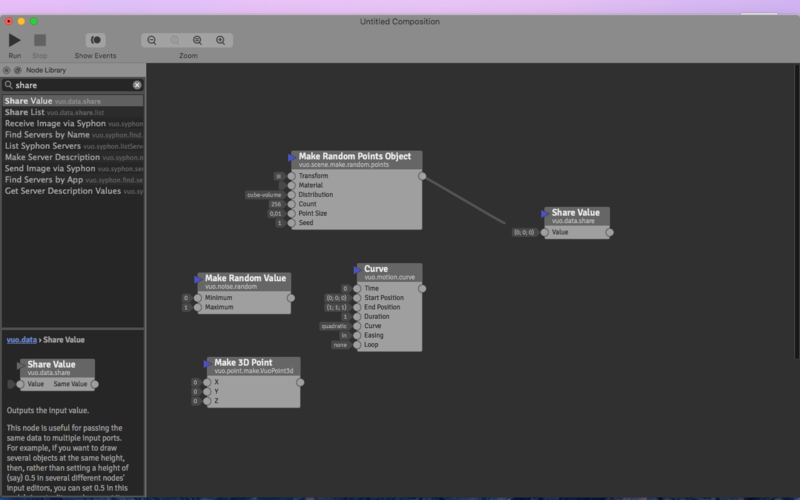 I like how Vuo ask you what converter to add automatically, but less when it shrinks a node down automatically because if you planned to connect that node to several other nodes, you have to manually recreate a new one from the library. May have overseen a part of the manual to prevent this. Joining a screencast as a sample with Mix Audio Channels, first one suggests (which is great), second one disappears, have to recreate one for the third connection. Added a feature request to address this: Only collapse type converters that were added automatically. Fantastic @Jaymie! 1.2.2 such a remarkable update! 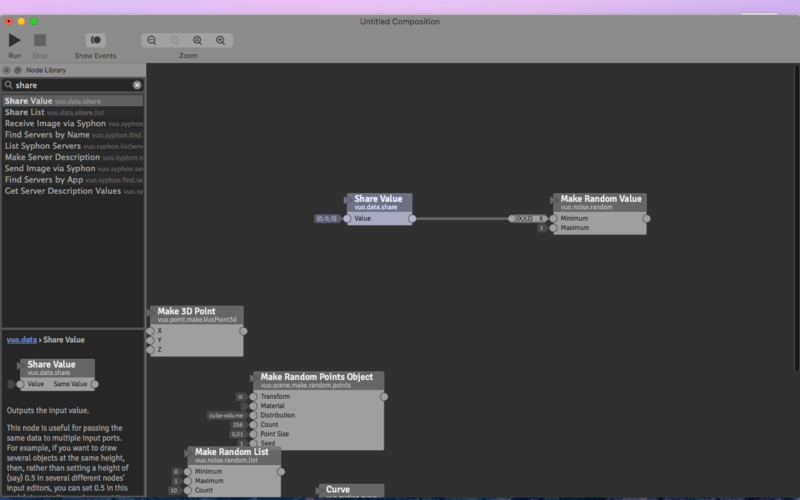 it would be nice for graph readability if the Shared Value node was collapsible to a converter sized node with input and output ports. I use input splitters a lot just to make wiring easier in QC and expect will do same in Vuo the more I use it. Perhaps all collapsed converter nodes could have an output port created if one drags them away from the Input port they are attached to? Make sense? Will FR if that seems logical. Are any nodes currently collapsible? Sounds like a new FR. no they aren't it's a FR. no they aren't it's a FR. thinking of modelling a few of these things in Origami actually. I'm currently trying to do a pan and zoom setup that I struggled with in pre-Origami days. once i get that sorted I can do some micro detail UI animation stuff that people can interact with and get a tangible sense of. I've been thinking that the hit zone around ports in Vuo and QC should prevent accidental dropping of cables, so like a buffer zone around ports where if you release mouse/stylus/trackpad it doesn't release cable, you have to mouse done on a port or 10px away from any ports to drop it. I drop way to many noodles and wires for one lifetime! Be able to collapse a Share Value node. Be able to detach a type converter node (leaving it collapsed). "a buffer zone around ports where if you release mouse/stylus/trackpad it doesn't release cable, you have to mouse done on a port or 10px away from any ports to drop it"
For (1), we'd actually like to introduce a better option than Share Value: Ability to detach constant value flags and connect them to multiple nodes. For (3), I understand that the problem you're trying to solve is to avoid accidentally failing to connect cables by dropping them in slightly the wrong place. Vuo partially addresses the problem by providing relatively large cable drop zones. Compared to QC's drop zone of about 14px x 10px (at default zoom level), Vuo's is at least 65px x 15px (larger if the port has a wide label or is the first or last on a node). Instead of introducing a "buffer zone" that affects the existing cable-drag interaction, another way to address the problem would be to provide an alternate cable-drag interaction that works better with a stylus. One possibility would be to right-click on a port, pick "create cable" from a context menu, which would stick the cable endpoint to your cursor until you clicked on another port (or on the canvas to cancel). This might better suit a stylus, as it would enable connecting the cable with a move + click instead of a drag + release. Had a rough go last night when using two different image types. having to right click and revert the port back to generic got really repetitive. not only is it misleading for new users. But, it's time consuming when Live Coding. Good topic to hash out. Thx Jaymie left a comment on the linked threads for (1) and (2). In terms of (3), i don't too much fancy having to right-click and then choose a menu item every time I want a cable to be run with 'click to complete cable' mode. And if i miss the port connection, I still would have to go back and run the cable again, so it doesn't really achieve the requested result. Having said that, and as you explained, Vuo ports are larger than QC ports, and easier to hit with the increased drop zone including the port label. So maybe the drop zone is more of a QC specific issue and less of a concern in Vuo, I really don't use Vuo regularly enough to form a strong opinion yet. One problem i did sometimes have in Vuo with long wire runs was where the destination port is off screen, the auto-scrolling was very zippy and hard to control, it easily used to overshoot the destination node. I just tested again and you seems to have made a slow scroll zone inside the fast scroll edge of the graph which is better!! I'm not really that keen for a two click solution but QC does the 'first click start cable; second click finish cable'. Doesn't always work though for stylus because just like dropping the cable on destination ports, with the stylus mapping set to a small tablet area (or with multiple displays connected) it can easily skid a few pixels during the mouse down and then you don't get a cable coming out. As far as QC is concerned, you started drawing a cable holding down the mouse and then dropped the cable only a few pixels from the spot you started it :-\ In my testing just then about one in three attempts at drawing a 'two click cable' fails to start a cable. It's totally a stylus sensitivity thing. Click-down and hold-down or two click wiring really doesn't solve that issue of pixel skidding during the mouse down/up moment, which is where i was coming from with the buffer notion, but lets forget it for now. If you did want to introduce two click wiring in Vuo for some other usability reason, the default behavior of single clicking on an output port produces a value info pop-up becomes an issue. Which makes things more complicated for what I'd like to see with two click . I wonder if a wire could be made to appear when the cursor moves a certain distance away from the port and the popup either stays there as long as it normally would (till you click another port) or disappears? Came into another situation that can be harsh for new users IMO. For example Select Input (Boolean) comes as Generic from the Node Library by default. If a user connect a cable from let's say a Real data type, Select Output auto sets to Real type. However, I cannot connect Audio Samples from let's say Receive Live Audio, probably because Vuo it needs a Mix Audio Channel node. If one manually sets the Data Type on Select Output to audio, then you can connect Receive Live Audio Samples to it, and Vuo auto-adds Mix Audio Channels, if not, doesn't work.